The subject of the Adoration of the Magi, along with the Adoration of the Shepherds, occupies pride of place in Jacopo Bassano’s repertory. There exist a number of variants of the composition of this miniature painting, both on canvas and stone, and their attribution to Jacopo or to other hands remains the subject of scholarly debate. 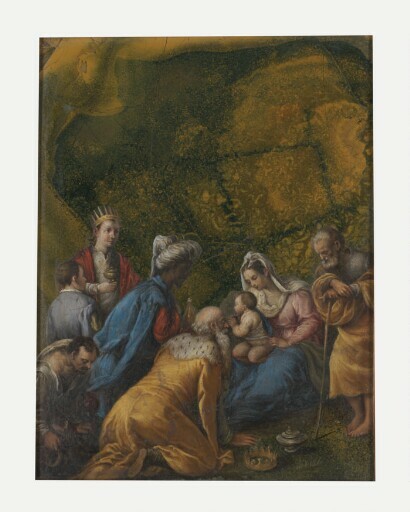 In the Kimbell painting, the yellow-veined green jasper background that serves as the picture’s support has been deftly integrated into the painted image to suggest an outcropping of rocks instead of the more traditional landscape setting with architectural ruins found in the versions on canvas. Small paintings on stone produced by Jacopo, or under his supervision in the prolific workshop he operated in conjunction with his sons, reveal a little-known aspect of the family’s output. Several of Jacopo’s contemporaries praised his skill in painting night scenes on small black stones, and a painting on slate is listed in the inventory of the artist’s studio after his death. Such supports became more common for miniature paintings during the Baroque period. In the Kimbell Adoration, the rare stone would have been valued as a precious specimen of nature, and for its smooth and durable surface, ideally suited for detailed brushwork. bequeathed to Kimbell Art Foundation, Fort Worth, 1990.